I don't know about you, but I have had just about enough of summer. I, frankly, don't want to see my feet again until May. No more pedis! Let us embrace the return of sock weather with a discount at SockMonkey, where we can get 15% off their subscriptions, and let Fall commence. I love Fall as much as I despise Summer prerequisites: Sweating, Sunburn, and Scorn. You might love Summer with all of your sweaty hearts, but there's something about the return of Fall that makes me as happy as the proverbial clam. Snuggly sweaters, long pants (remember long pants? Ah, memories) and SOCKS. Begone, sandals and flip flops! Hie thee away, shorts and capris! I want to hide my pale extremities under some good ol' fashioned autumnal clothes, and where would we be without our own personal foot-huggers, the humble sock. I know, I know. Socks aren't exciting. But they can be! Even the most boring, standard outfit can be downright whimsical with a fun pair of socks. Just imagine wearing your standard pants and top to work or around the house, and underneath, your feet are having their own little party in a completely silly pair of socks. Stripes, polka dots, funky colors, whatever you want. Let the colors of the rainbow be your guide. And the kids? The kids love silly socks. Take a lesson from them and hie thee to SockMonkey to subscribe to their program that sends you two pairs of socks per month for only $19 a month for adults (available in fun or conservative) $16 per month for tweens, and $15 per month for kidlets. You'll get a package once a month with your fun new socks, and just look at the selections they have! We offer high-quality handmade socks sent to your home every month. Our socks have unique designs that are not available in stores. We offer a popular gift program that allows users to send gifts with a hand-written thank-you note. 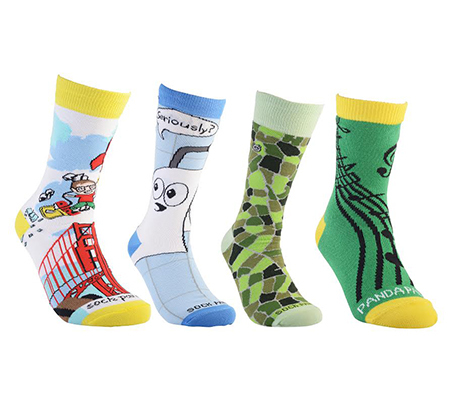 Choose from different types of fun socks for every personality type such as bold and conservative, and designed for men, women, and kids. The Sock Panda team is dedicated to using its socks to make the world a better place. We donate socks to those in need for every subscription purchased. As of October 2014 the company has donated nearly 10,000 socks to homeless shelters, low income senior centers, and under-privileged classrooms across the country. Amazingly cute kids socks of Peruvian cotton. So click away at the banner below to get your subscription started, and HAPPY AUTUMN TO US ALL!